Schaffer’s Mill and its beautiful Tahoe Vacation Home Rentals is a private golf course community located at the edge of beautiful Martis Valley in Truckee. It’s ideal location between Northstar and downtown Truckee, Truckee Airport that serves private air-crafts is only minutes away, North Lake Tahoe’s Shores are only within 10 minutes drive, not to mention Schaffer’s Mill amenities make it a year round luxury vacation destination. Click below to see our amazing Schaffer’s Mill North Lake Tahoe Vacation Rentals! The Clubhouse at Schaffer’s Mill is a spectacular collection of buildings located in the center of Schaffer’s Mill Community. Here you’ll find The Sports Shop, The Market (restaurant and cafe in the village), Millworks (workout Facility), The Family Pool, Peg’s Poolside Restaurant and Schaffer’s Square. Each structure serves a particular purpose, which in most cases, is to provide fun, entertainment, and adventure during your stay in Schafer’s Mill. At the Sports Shop you’ll be able to start your Schaffer’s Mill adventure, here you’ll learn more on golfing, skiing, hiking, fishing and any other activities you can think of in North Lake Tahoe and Truckee. With the beautiful country that surrounds us, we spend as much time as possible being outside and the wonderful staff at the Sports Shop will help you do the same. The Family Pool, while not a structure, is the place where you’ll swim, play, relax and enjoy Martis Valley’s beauty. While away the long days of summer enjoying the cool waters as you frolic with your family, or simply enjoy the heat of the sun beating down on your shoulders while sitting in comfort in the patio chairs that surround the pool; multiple tables spread out on the deck offer plenty of space for conversations with your vacation neighbors. At the Millworks you can get your daily workout in, use the gym, or take a class and relax in the sauna or get a massage done after all, the choice is yours, the Millworks will not disappoint. Many times, we tend to forget to take care of ourselves, even during a fabulous Tahoe vacation, so having the fitness center so close to where you are sleeping works as a gentle reminder to take care of you. The Market is the place where you can start your day with a coffee, stop and have a quick lunch or just go for refreshments, a 3 in one, coffee shop, juice bar and cafe will keep you full of fresh daily prepared foods. Perfect for those days when the idea of fixing a meal, or even hitting the town for a big breakfast seems to be too much effort. Peg’s Poolside is a great place to enjoy a drink by the swimming pool, enjoy your favorite cocktail a soft-drink or a salad while soaking in the sun. There’s never a bad time for a refreshing adult beverage and Peg’s provides the tastiest ones in the region. And of course being a Golf Course Community play golf on the 18-hole course, designed by Johnny Miller and John Harbottle and plays 7,022 yards from the championship tees. The front side is more gentle, weaving through trees at the base of the ridge, while the back nine trudges up and down a mountain and makes for some dramatic shot making. Make your vacation stress free and use Schaffer’s Mill Shuttle to travel, and to make it your dream vacation, book our Schaffer’s Mill Vacation Lodge today. Driving around a new place can be a scary proposition, but not when you’re being chauffeured by our skilled and safe drivers who also happen to know the way to all the best spots in town. Our Luxury Vacation Home at Schaffer’s Mill in Truckee awaits you! This brand new custom built home boast elegance in its 2140 sq. ft. floor plan plus (2) car garage situated on one of the best Golf Courses in Truckee. Our Schaffer’s Mill Vacation Delight is sure to impress the most discerning of guests. This Luxurious lodge is an exceptional retreat located in the picturesque Martis Camp Valley away from the tourist traffic, but only minutes from some of the finest activities North Lake Tahoe has to offer. Our luxury vacation home at Schaffer’s Mill in Truckee awaits you! This brand new custom-built home boasts elegance in its 2140 sq. 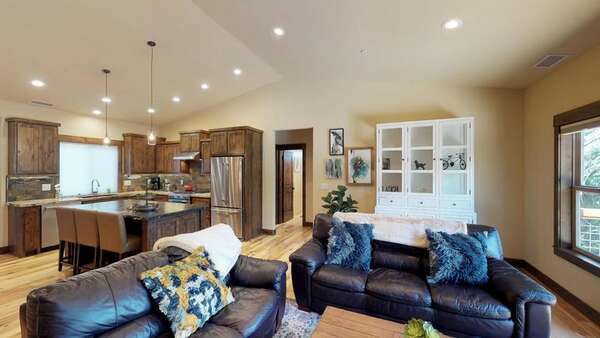 ft. floor plan, plus a two-car garage situated on one of the best golf courses in Truckee. Our Schaffer’s Mill Vacation Delight is sure to impress the most discerning of guests. The wood, stone, and glass exterior only hints as the wonders that await you inside, so go ahead and turn the key on incredible. As the door swings open, revealing the secrets of this luxury vacation home, the exuberant child inside you will not be able to hold back a cry of glee as you follow the golden glow of warm wood floors to rooms that are designed to shine. The open concept floor plan allows you to be a part of the fun, even if you are in the spacious kitchen that is the heart of the home. Custom cabinetry, classic granite countertops, and sophisticated pendant lamps that dangle over the breakfast bar blends nicely with the velvety furnishings, stone fireplace, and vaulted ceilings of the living area. Spacious bedrooms painted a warm golden hue are havens of peace and tranquility, while more fireplaces in the bedrooms keep even the coldest of guests cozy and warm. Spa-like bathrooms with jetted soaking tubs, walk in showers, and luxury toiletries will have you feeling spoiled, pampered, and cherished. Our attention to detail makes this stunning place your brand new happy place! See more pictures of our Schaffer’s Mill Vacation Lodge or call 530-562-4242 to book it. If you are a homeowner at Schaffer’s Mill and would like to hear more about our services please visit our Vacation Management Services page or call today 530-562-4242. Feel free to ask us any questions you may have.